In ancient times just as today, people were concerned about their safety when they traveled. So it is not surprising that safe journey or safe travel charms compose a major category of old Chinese charms. 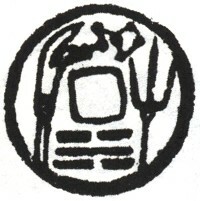 A rubbing of one of the more interesting examples of this type of charm is shown here. The inscription, written in seal script, reads “shui lu ping an” which literally means “may you have peace by land and water” or, more simply, “I wish you a safe journey”. The reverse side has an unusual mix of Chinese charm symbols. Above the square hole are seven dots connected by a zigzag line which represents the star constellation known as the “Big Dipper” or “Ladle”. The “Big Dipper” was seen by the ancient Chinese as the Emperor’s chariot which, rotating around the fixed and unmoving North Star, demonstrated his control over the universe. 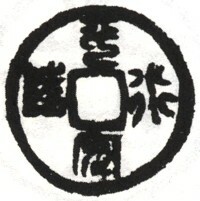 Below the hole is one of the “eight trigrams” (bagua). This is the trigram kan which represents “water” and the direction “north”. To the left and right of the hole are ancient Chinese blade weapons. The weapon depicted to the left of the square hole has particular significance. It is a guan dao or “Green Dragon Crescent Blade”. The notch in the blade was to catch and parry the enemy’s weapon. This was the weapon of choice of Guan Yu, who was originally a beancurd seller, but who joined with Liu Bei and became immortalized as a military hero during the period of the Three Kingdoms (220-280 AD). History, legend and myth gradually merged over the centuries to make Guan Yu the “God of War”. The weapon to the right of the center hole is known as a “Trident”. It was primarily used as a hunting weapon but one which could also be thrown. The linking of the “Big Dipper” with swords established the belief that the weapons could be used not only in wars against human enemies but in battles against evil spirits as well. The images of the bladed weapons, the Big Dipper and the “water” trigram, along with the association of the “God of War”, combined to provide powerful protection to a person whether he traveled by land or sea. But there are some who believe that this “charm” played a role even more important than simply being a travel talisman. 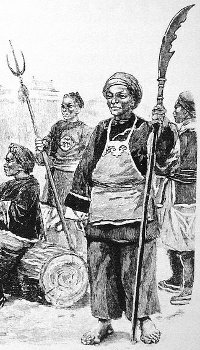 Around the year 1900, there was a secret society in China consisting primarily of poor peasants and workers known as the “Righteous Fists of Harmony” (yi he tuan) which opposed various “evils” affecting the country. These evils included the opium trade, foreign imperialism, unequal treaties and Christian missionary work. The “Righteous Fists of Harmony” became the “Righteous Harmony Society” and adopted the slogan “support the Qing, destroy the Foreign”. The group believed that a mixture of the martial arts, spirit possession, and swords, would make them invulnerable to guns. This ragtag army became known as the “Boxers” and the uprising is referred to as the “Boxer Rebellion“. The rebellion, however, was ultimately put down by the combined forces of eight foreign countries. The Chinese charm dates from this same time period and is believed by some to have been a secret “badge” carried by members of the Boxers. As can be seen in the illustration above, which dates from the year 1900, the weapons used by the Boxers were the same as those displayed on the charm. As already mentioned, the trigram kan represents “water”. According to the Daoists, nothing is softer or weaker than water. But water can wear away even the hardest substance. The trigram is thus a symbol that a mass movement of Chinese peasants could defeat the smaller but better equipped army of Western “devils”. The “Righteous Harmony Society” was organized into eight groups named after the eight trigrams with one of the groups being the “Kan Trigram (Group) of the Righteous Harmony Society”. The trigram kan also represents the direction “north” and the Boxers were from northern China. Many old Chinese charms were created with the purpose of ensuring protection during a person’s comings and goings. This particular charm has the additional distinction of being involved in one of the major historical events leading up to the collapse of the 2,000 year old Chinese empire.